I would like to be seated atop a mountain, anticipating the taste of the rich espresso that is pouring forth from my portable Handpresso Pump, as the man on the Handpresso website appears to be doing, but I can’t. Not because I don’t have a Handpresso Pump, which Handpresso says “enables you to drink an Italian espresso wherever you are,” be it on a mountain or trussed into a tiny sailboat, but because I am in hell. And in hell, you don’t get to drink espresso. How did I get to hell, you wonder? I was dragged here, kicking and screaming, by the Handpresso Pump, an aggravating gadget that produces an espresso that would caffeinate a Lilliputian but doesn’t come near giving a regular-sized person the java they’re jonesing for. 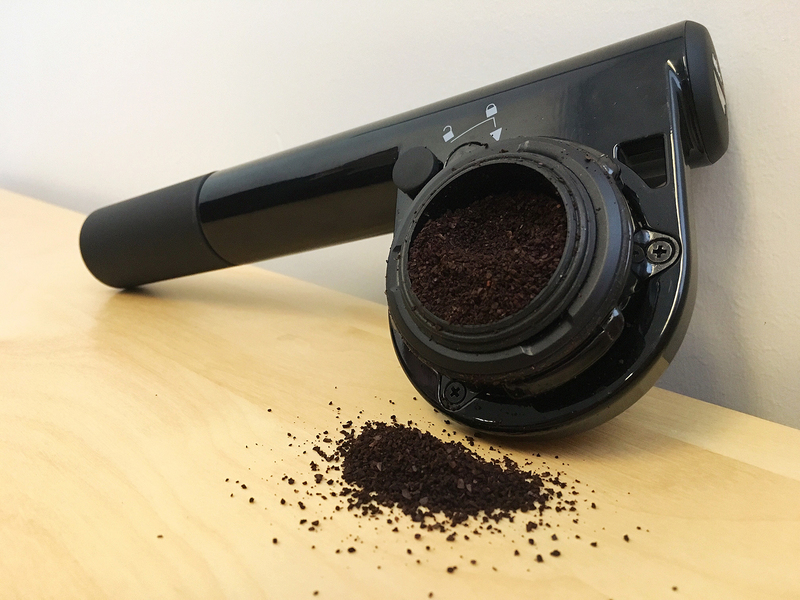 I first tried the Handpresso Pump at Canadian Geographic’s office, which perhaps wasn’t the ideal testing ground, given Handpresso’s emphasis on using the pump outdoors, but what the heck. I wanted to drink an Italian espresso wherever I was, and I was at work, where the coffee is abysmal. So how could this be a bad thing? Without going into step-by-step detail, let me just say this: there are 15 separate actions — twisting, pumping, unscrewing, inserting (don’t ask), rotating and pushing among them — involved in making an espresso with the Handpresso Pump. Fifteen! Does that seem like too many to you? It did to me. By the time I got to step 16 — “Finally, relax and enjoy your espresso” — I was apoplectic with a rage that could not be quenched by the piddling amount of coffee in my cup. And yes, it has occurred to me that cutting down on my coffee consumption could make me less volatile. But still. Would using the Handpresso Pump have been any easier to do on a mountain, an alpine wind scattering my precious Lavazza grounds across the scree? Or on that sailboat, maybe, pumping the contraption to 16 bars of pressure while trying to gauge wind direction, work the tiller and keep an eye on the goddamn kettle? No. And that’s the problem with the Handpresso Pump. It’s marketed as a brilliant take-it-anywhere convenience but it’s actually a disappointing $150 hassle. Hey, can I get a cup of instant down here?